The United Nations Development Programme’s Joint UNDP-DPA Programme on Building National Capacities for Conflict Prevention is built on the premise that national actors lead the way in conflict prevention efforts, and that success in prevention is a pre-condition for achieving sustainable development. Widely recognized for its work on conflict prevention, the Joint Programme consistently leads successful ground-breaking initiatives to support the establishment of national peace architectures and local mediators. For the second consecutive year, Alamini Creative Group was asked to create the Joint Programme’s Annual Report. The report analyzes the impact of the Joint Programme and highlights its impressive work in over 60 countries across the globe. 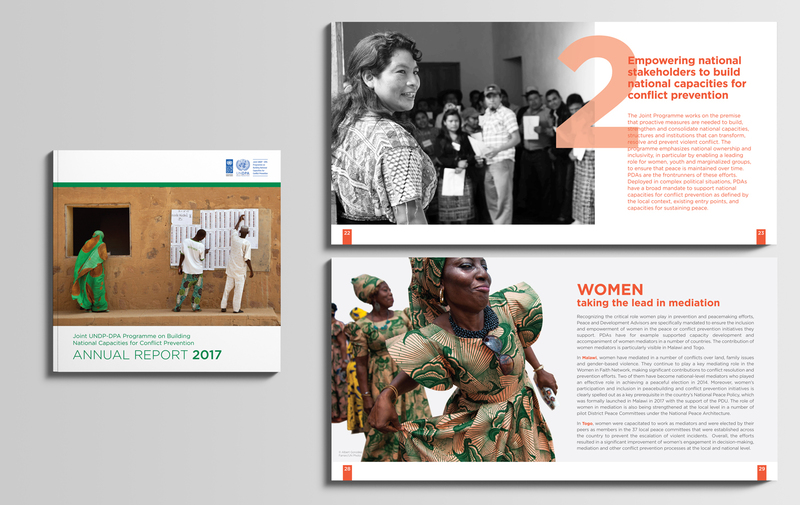 The 2017 Annual Report was launched before high-level United Nations executives and members attending the Joint UNDP-DPA Programme annual meeting held in May 2018.